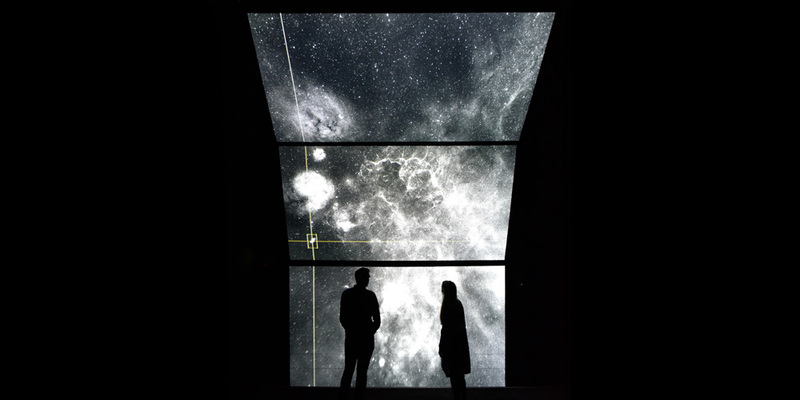 Inspired by the latest discoveries in the field of astrophysics, unfold, an immersive and sensory installation seeks to translate into sounds, images, and vibrations, the phenomena surrounding the formation and evolution of stars and galaxies. With unfold, Ryoichi Kurokawa is concerned with the synesthetic, merging audible and visual materials, in the service of an art/science project inspired by recent discoveries. These findings have been made by astrophysicists at CEA-IRFU, based on data produced by the satellites of the European Space Agency and NASA, and more specifically by the Herschel space telescope. The telescope’s observations of far infrared radiation have revealed some of the conditions of star birth and the history of the life of galaxies, over the course of 10 billion years. In addition to this data that allows us to trace the cosmological history of star formation, especially the filamentary structure of molecular clouds where stars are born the artist also based his logic on numerical simulations intended to model the universe and its structures, produced by astrophysicists at CEA-IRFU, with the help of supercomputers. The project, created under the supervision of astrophysicist at CEA-IRFU, Vincent Minier, enables us to go beyond research and scientific discovery, in order to question the representation and publication of the data collected. Ryoichi Kurokawa (JP), born in 1978, is a Japanese artist who lives and works in Berlin. Kurokawa’s works take on multiple forms such as installation works, recordings, and concert pieces. He composes time sculpture with field recordings and digitally generated structures, and reconstructs architecturally audiovisual phenomenon. In recent years, his works have shown at international festivals and museums including Tate Modern [UK], Venice Biennale [IT], transmediale [DE], and Sonar [ES]. In 2010, he was awarded the Golden Nica at Prix Ars Electronica in the Digital Musics & Sound Art category. Co-commissioned between FACT (Foundation for Art and Creative Technology), Stereolux et Salford University, with the support of CEA-IRFU – Paris Saclay (Alternative Energies and Atomic Energy Commission / Institute of Research into the Fundamental Laws of the Universe), Arcadi and DICRéAM (Dispositif pour la Création Artistique Multimédia et Numérique).